Facebook is introducing a new bid strategy for advertising which is focused on driving results while keeping costs down. Bid strategies for Facebook ads were previously focused on maximizing conversion volume (bid cap) or cost predictability (target cost). To help businesses better reach certain goals, Facebook will offer a bidding strategy that combines both of its previous offerings. What separates cost cap bidding from other cost-optimized bidding strategies is that it allows advertisers to set the max CPA/CPI they’re willing to pay. When it rolls out, cost cap bidding will be accessed through an updated, guided bid experience. 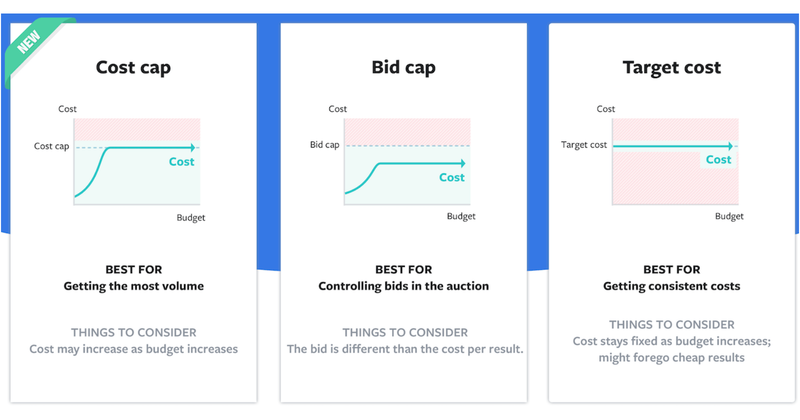 As shown in the example above, advertisers can enter a cost control, which Facebook will aim to meet with the cost cap bidding strategy. There is no set date for when cost cap bidding will be available. Facebook says it’s rolling out to advertisers throughout the year.